There are several species of poison dart frogs found throughout Peru, Ecuador and the Colombian forests. Though the range of species is large, their numbers are dwindling and the reason is man. With the demand for land, special lumber and poison, the number of poison dart frogs is falling fast. Understanding the human impact on poison dart frogs can help you make better ecological choices to help protection efforts. According to the Smithsonian National Zoological Park, a number of poison dart frog species are declining in population due to deforestation. Because many species live in tropical forest climates, their homes are being destroyed to harvest special varieties of wood and make room for civilization and roadways. Deforestation not only reduces the land the frogs are able to live on, but reduces food sources and leads to new threats, such as death by motorists. Poison dart frogs are also used by natives to hunt, hints the name poison “dart” frogs. The animals are sometimes speared and held over an open fire so that the toxins are released through the frog's skin. The poison is then collected and applied to arrowheads. Depending on the species, the poison can be lethal enough to bring down animals as large as elephants. Of course, hunting for food isn't the only hunting that is dangerous for poison dart frogs. The golden poison dart frog is often killed in the process of mining for gold. Cyanide is used to bind the flecks of gold found in the streams of Colombia and kills everything in its path. While man has had a negative impact on the frogs, there are positive things being done to help protect the species. According to "USA Today," the golden poison dart frog was given a 124-acre reserve in South America in 2012. Strangely enough, this happens to be one of the most toxic animals on the planet. 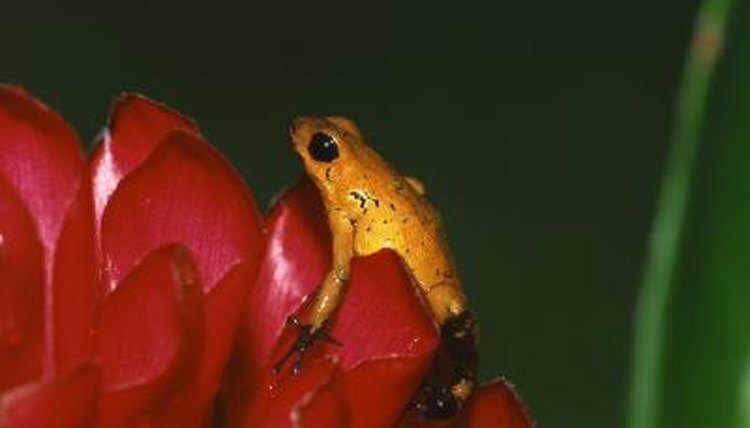 Before the reserve was founded, the golden poison dart frog was an unprotected endangered species. There are some species of poison dart frogs that can be used for medical purposes. This has lead researchers to work towards rebuilding the population of certain species. The poison from one species has the ability to be used as a painkiller. The problem with repopulation is that the species must be reintroduced to an area that contains the food source that makes them toxic. For example, the golden poison dart frog's food source is a special beetle that causes the toxicity. When fed a diet of crickets, the frog loses its ability to create toxins. How Does a Toad Protect Itself? What are the Dangers to Frogs in Our Environment? How Can Frogs Tell Us About the Environment?